Believe in the possible . . . with this New York Times bestseller by three-time Newbery Honor winner Jennifer L. Holm. A perfect read about a child's relationship with her grandfather! 25 STATE AWARD LISTS including the Sunshine State! JENNIFER L. HOLM’s father was a pediatrician and she grew up listening to him talk about the wonder of antibiotics and how science could change the world. 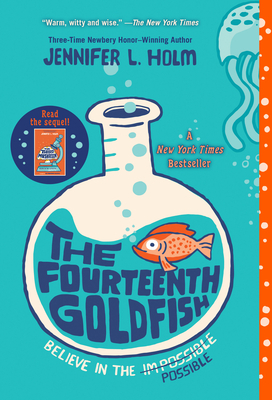 Today Jennifer is the New York Times bestselling author of three Newbery Honor books, as well as the co-creator of the Babymouse series (an Eisner Award Winner) and the Squish series, both of which she collaborates on with her brother, Matthew Holm. Find out more about her by visiting jenniferholm.com and look for her on Twitter at @jenniholm. "A great choice for book groups and class discussions as well as individual reading." "Holm’s writing is crisp, accessible, and well paced, and her enthusiasm for science and its impact emerges clearly and consistently but not overbearingly, with clear, appreciative nods to the world of theater and its purpose in our lives. Indeed, this novel explores weighty elements of human existence with a light touch, allowing readers to engage with the issues at multiple levels; an excellent appendix of recommended readings encourages exploration and dialogue. This novel would make an ideal classroom read aloud, particularly to expose students to the rich and rewarding STEM fields."